We’ve been sending off our loved (or not so loved) ones since the beginning of time. While our End is always the same (dead is dead, however the end may have come) the rites, rituals and traditions take on as many different forms as there are cultures. Long-standing tho these may be, new ones are being created. In this age of environmental consciousness, Cracked.com reminds traditional burials are not the most pro-Earth way of leaving the planet, especially if your body is full of embalming fluid and your coffin is made of lead-lined processed wood. 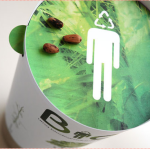 The Bios Urn is “a biodegradable urn made from coconut shell, compacted peat and cellulose” which comes with a tree seed. After you die, someone packs your remains into the thing and presto – you start to grow. In the late 1800s, New Englanders would gulp down a cocktail of water and their family member’s ashes in order to keep them from returning as vampires. “The worthless body provides sustenance to the birds of prey that are the primary consumers of its flesh”. 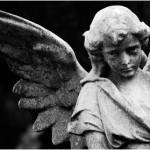 Many cultures want to make sure the soul has some support on its journey: From The Funeral Source, Greeks placed a silver coin called an obolus in the dead person’s mouth, so that the soul would have passage money across the River Styx into the under world. When Meyer was 21, she lost her father, an entertainment lawyer, to lymphoma. She took it upon herself to give him a fitting send-off. “I planned it like an event. It was a success!” she says. The casket was hidden under a blanket of peonies; songs by the Stones and David Bowie were played, loudly. “Someone said, ‘I want to dance,’ and my best friend, Ali ­Hilfiger”—Tommy’s daughter—“said, ‘Go ahead, then, dance!’ ” Afterward: lunch for 200 at Centolire. 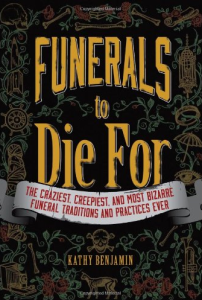 Should you want to know more about Funerals of the Famous, look no further than the online magazine of the same name.